Please join The Wolcott Republicans for a Ziti Dinner/Rally on Friday, June 9th ● 5:30pm – 8:00pm at the Wolcott VFW – 1115 Wolcott Rd, Wolcott, CT 06716. Governor Malloy and the Democrats want to cut funding to the Town of Wolcott by 35% = $5.7 million! This is Unacceptable! Enough is Enough! It’s time to speak up and fight back. Tell Gov. 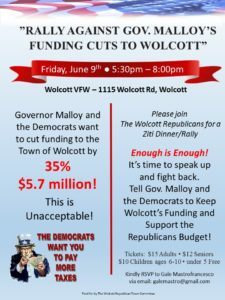 Malloy and the Democrats to Keep Wolcott’s Funding and Support the Republicans Budget!